John Franklin Dyer, is my great-great grandfather and he lived in Richwood Township, Richland County, Wisconsin for the majority of his life. He was born to William Samuel Dyer and Barbara Ann Hinton on 27 Aug 1868. The story of this homestead begins with Johnie F.'s father, William. The plat map from 1895 indicates that these sections of land are owned by William, who acquired the land when Johnie F. was a child. In 1890, Johnie F. married Estella Haskins. By the 1905 Wisconsin State Census, they are listed as owning the land. 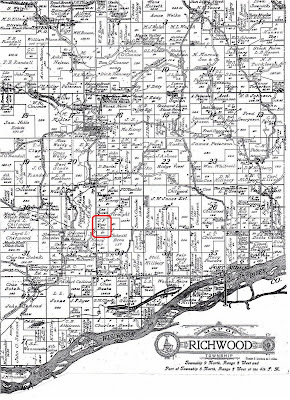 The 1919 plat map, shown above, indicates that a small piece of the land was sold and they acquired an equally sized piece that aligned better with their property. From the 1920 US Census we know that Johnie F. and his wife Estella still had a mortgage on the farm and were actively farming the land. Sarah where do your Dyers come from? I love land records. Where did Hans J. Hanson live?